Gilda first came to us through another cat rescuer who had to move some feline inventory. 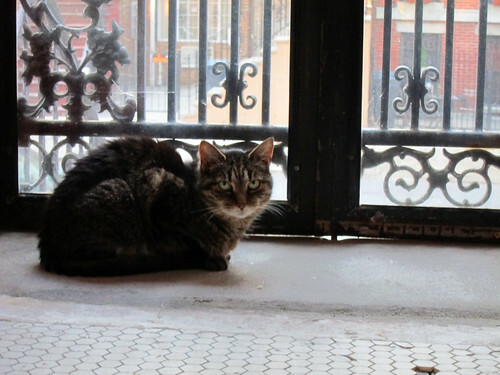 We offered to take in two elderly cats, Gilda and Mabel, for "a few months" until she could take them back. Well, of course they never went back and became members of the household. At the time we thought Mabel was the elder of the two, she looked so bad. Even though Gilda was clearly up there in years, she looked like a spring chicken compared to the emaciated, polyp-ridden wreck that was Mabel. Who would have guess how they would swap places over the next few years. As you may know, after some much-needed surgery, Mabel is now better than ever, with an adjusted age of 7 instead of the 18 we estimated at first. But ol' Gilda, she turned out to be at least as old as she appeared. After a bout of giardia she struggled to put on weight. She was picky with food and shy, often hiding from us. But we often spied her in the bed with us late at night, and slowly she warmed up to us. At some point we decided we should get her vetted to see where she was at, health-wise. When the bloodwork came back our vet said "A cat with numbers this bad should be hospitalized." We had no idea she was so sick, we just thought she was a little stubborn. The verdict was advanced kidney disease (CKD/CRF), she would need some serious intervention to keep going. This was a huge change for us. We had just been sympathizing with a friend who had to give her cat fluids 3 times a week and suddenly found we would have to give infusions of fluids every single day. We started in on it (and soon Jeannie took over the fluid duties so I could spend valuable time cleaning litterboxes) and it soon became routine. Once all parties get used to it, it's not so bad, and the change in Gilda was evident. She was much more active and engaged (albeit in her own low-key way). We set her up in her own room so she could have 24-hour access to food. Getting her to eat was tough and we quickly abandoned the kidney disease diet in favor of the "whatever you can get her to eat" diet. This mostly involved Fancy Feast, we got every flavor to be able to rotate them at will (if you stick to the 'Classic' flavors, FF is not actually too bad of a food, certainly better than most dry cat foods). Any time we thought there was something she'd like we'd try it out, resulting in a lot of leftovers for the other cats, which they loved. Gilda never ate as much as I wanted, she was always too skinny. We put a space heater in her room during the winter to keep her warm, and would warm up her fluids when it was cold out. She loved being brushed and having her chin scratched, she loved napping in boxes or on her cat tree or window perches. We miss not seeing her in the window when we come home. We had Gilda for 3 years but we don't really know how old she was. She was on sub-q fluids for over a year and a half, which I'm told is a very long time for cats with such advanced kidney disease. The experience has made me a big believer in fluid therapy, and having the gear in the house has allowed us to give fluids to other cats through various ailments. It can be a highly effective treatment. But in the end, Gilda was still dehydrated even with all the fluids we were giving; she wasn't eating at all and she couldn't get around like she used to. Her last few days were spent curled up next to the space heater, barely raising her head when we entered the room. We found a house call vet who lives in the neighborhood, a real boon for us. We hated the idea of dragging her to the vet's only to confirm what we already suspected. If she was on her way out, we wanted it to be as easy as possible. The vet made the whole process go smoothly, and once we decided we should let her go, she went very gently, probably with no more discomfort than her daily fluids. When I think of Gilda I see her as she was at the end, and I probably will for a while. But I hope happier memories will replace these soon, something like this video taken in May when she was momentarily transfixed by this toy. Of course she completely lost interest and never gave it another look after this. So Gilda. This entry was written by Jimmy Legs, posted on December 17, 2013 at 4:22 pm, filed under Bad Stuff and tagged Cats, Gilda, RIP, senior. Bookmark the permalink. Follow any comments here with the RSS feed for this post. Both comments and trackbacks are currently closed.